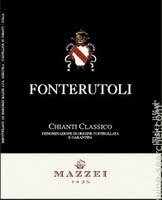 Wine Advocate Review Rated 90 From the Mazzei brothers' beautiful, state-of-the-art winery at the heart Chianti Classico, the 2011 Chianti Classico Fonterutoli is made from a blend of different Sangiovese clones with some Malvasia Nera, Colorino and Merlot. Spice and leather add fullness to the back, but berry aromas of cherry and dried mulberry take center stage. The wine does a great job of presenting the elegance of Sangiovese against the soft richness of modern winemaking. Anticipated maturity: 2014-2018.